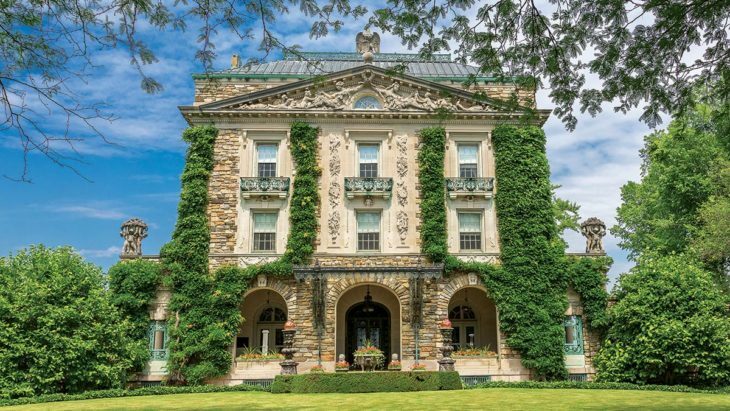 Just outside New York City, the Hudson Valley and Long Island area are full of grand estates and historic houses. Those were the playgrounds of the rich during the Gilded Age, and mansions were built along the Hudson River, and on the Gold Coast as described in the Great Gatsby. Here is a look at some of the wonderful estates where you can spend a lovely day touring and wandering through their idyllic landscapes. Kykuit (pronounced kai-cut), the Rockefeller Estate was built in 1913 by John D. Rockefeller, the founder of Standard Oil, once the first American billionaire and the richest American. Situated in Pocantico Hills, it is only 45 minutes by train from Grand Central Station. You can enjoy majestic views of the Hudson River from the grounds. During a visit to Kykuit, you will get to know the history of this home where four generations of Rockefeller’s lived. A visit to Kykuit is much more than a simple estate tour though. The home certainly has beautiful interior and exterior architecture, fine furnishings, and collection of Chinese and European Ceramics. However, there is art that is well placed and chosen throughout the home, which would greatly please art lovers. Nelson Rockefeller has turned the basement into a modern art gallery, featuring Picasso tapestries in addition to famous work by Alexander Calder and Joan Miro. After touring the interior, you can enjoy the beautiful English garden with modern sculptures. There is also a variety of classic cars on display in the Coach House. The Rockefeller estate has been designated a National Historic Landmark in 1976, and open to the public since 1979. You can visit the estate via guided tours on Wednesdays through Sundays from spring to fall. The Vanderbilt Mansion at Hyde Park dates back to 1764 and is one of the oldest Hudson River Valley estates. Like all other Vanderbilt mansions built at the turn of the century, you can still see the extravagance of the home. The stone mansion has 54 rooms and was built in the Beaux-Arts architecture style. The major public rooms of the estate are on its ground floor and are all lined up parallel to the Hudson River. Outside of the home is a formal Italian Garden with multiple tiers of plants. The mansion includes 211 acres of waterfront real estate that includes woodlands, and a hiking trail where you can overlook the Hudson River with the Catskills Mountains as a backdrop. The grounds at the Vanderbilt Mansion is open to the public, while you can join tours to visit the interior. Every year the mansion is decorated for winter festivities, and are open at a designated time to the public for free for visits. You can take a hike on the Hyde Park Trails system, where you hike from the Vanderbilt Mansion to the nearby Franklin D Roosevelt presidential library, and the Staatsburgh State Historic Site. 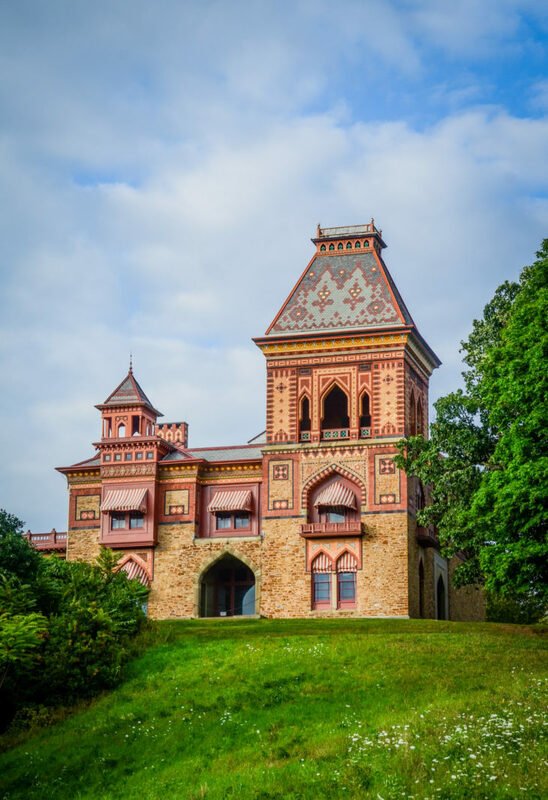 A little further North, the Olana Historic Estate is located in Hudson, New York, a 2-hour drive North of New York City. The estate was home to Frederic Edwin Church, one of the major painters in the Hudson River School of painting. Although perhaps not as impressive in grandiose as the other mansions on the list, it is certainly a unique and beautiful estate. It has the most majestic site of being located high above the Hudson River, where you will see endless views of the Hudson River, rolling hills, the Catskills and the Taconic Range. The spectacular landscape is exactly what inspired the Hudson River School artists. The style of the estate is quite unique. Unlike any other estate in the region, the building is built with a mix of Victorian, Persian, and Morrish styles. The interior of the home contains many objects of Frederic Church’s life, including many items collected from this Middle East travels. For art lovers, there are of course also paintings to be enjoyed inside the home. The grounds of the Olana Estate is open to public, and you can arrange to visit the interior of the home by checking their tour calendar. There are also art lectures and events that take place at the estate throughout the year. The Sands Point Preserve is a 216-acre site that houses not one, but four mansions that constitute the Guggenheim Estate. Located in Port Washington, along with the Gold Coast of Long Island, walking on the grounds of the preserve along the Long Island Sound conjures up images of extravagant parties and flapper costumes from the 20s. The original estate on Sands Point was built by Howard Gould, the son of railroad tycoon Jay Gould. They completed a castle that was to be a replica of the Kilkenny Castle in Ireland. Upon completion, they decided that they would build another castle-like mansion instead. The main house is called the Hempstead House. Built-in Tudor-style, it boasts 40 rooms and has 50,000 square feet. When the second castle was completed, they sold the estate to Daniel Guggenheim in 1912. Two additional mansions were later built on the grounds, called Mille Fleur and Falaise. Today, the Sands Point Preserve is a non-profit institution and is open to the public for a plethora of events. There are mansion tours, concerts, tea parties, Halloween balls, and you can even rent the estate for your wedding. There are also many activities for kids and adults, ranging from after-school art programs to summer camp and yoga classes. It is also the setting of several movies and tv shows. The preserve grounds is perfect for walks, and you can also access the beach on the North Shore and enjoy its beautiful views. Sagamore Hill is the home of Theodore Roosevelt, the 26th President of the United States, from 1885 until his death in 1919. Located in Oyster Bay, the 22-room Queen Anne style house is located on 155 acres. Although Sagamore Hill is not as imposing as other estates along the Gold Coast, it served great historic importance during the eight years that Roosevelt served as president. It was known as the ‘Summer White House’, and Roosevelt has hosted numerous foreign dignitaries at home, which helped negotiate and to end the Russo-Japanese War. 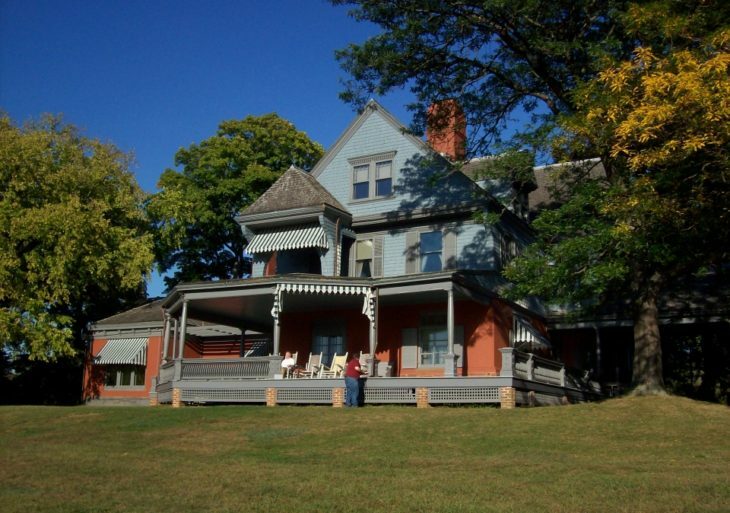 Sagamore Hill was added to the National Register of Historic Places in 1966. Today, visitors can tour the grounds for free, and also visit the interior of the home and see most of the original furnishings still in place on a guided tour. You will also get to see exhibits of interesting personal possessions which helps tell the story of his legacy, including old flags, silverware, swords, firearms, see photos and videos at the Old Orchard Museum. Roosevelt, being a nature lover who started the National Park Service, the grounds of his Sagamore Hill do not disappoint. You can take a stroll through the woods to the marsh and bay beach.